It is important to note that an employment relationship cannot be forced upon either an unwilling employer or employee. Therefore, an employer has a right to hire and fire, likewise an employee has the right to resign from an employment. 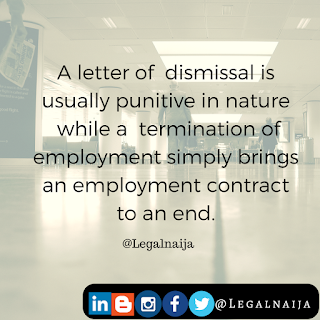 Many a times, the words “dismissal” and “termination” are used interchangeably when referring to an employee whose employment has seized. This may be appropriate in general discussions, however, under the law, a dismissal and a termination of employment have completely different interpretations and consequences. A letter of resignation represents an employee’s desire to quit a job; however, the effects of a letter of dismissal from an employer are quite different from those of a letter of termination. The Oxford Dictionary describes the word “dismiss” to mean to send away from one’s presence or employment, it also describes it as meaning to “reject”. 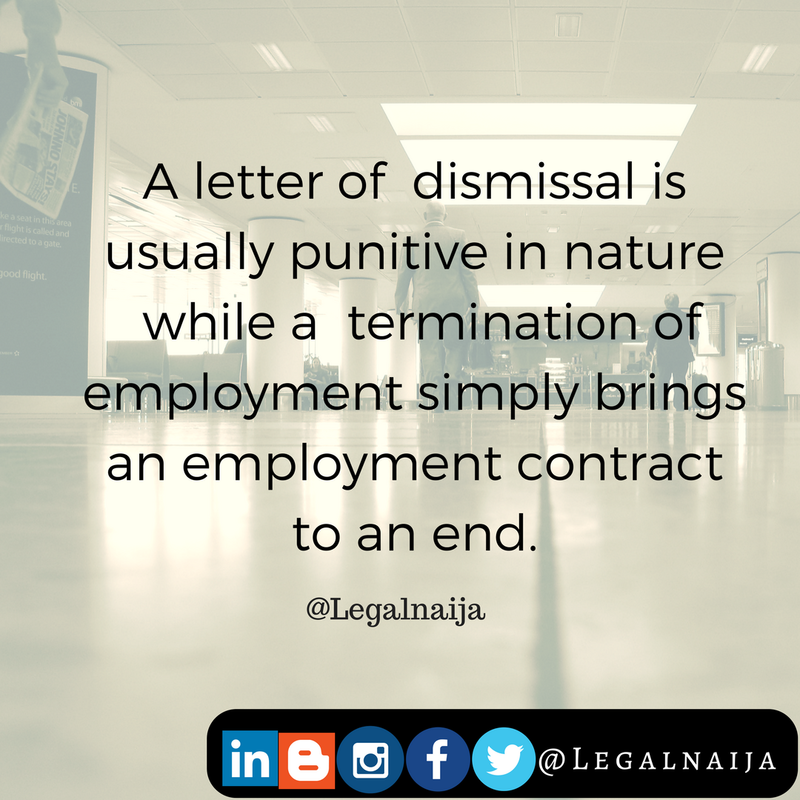 Likewise, a letter of dismissal is a rejection of the employee by the employer, such rejection which is usually for a reason. "It is now well settled that in statutory employment, as well as in private employment, the employer can dismiss an employee where the accusations against such employee is of gross misconduct involving dishonesty bordering on criminality, and in such a case, it is not necessary, nor is it required under Section 36 (1) of the 1999 Constitution that employee must be tried in a court of law." "Where his dismissal is founded on the allegation of gross misconduct the appellant is not entitled to any notice or salary in lieu of notice …………. And it would be wrong in law to make any awards to him in these regards." The above is a guide to help when considering, the legal implications of a letter of dismissal and a letter of termination.